the ocean in your bedroom: 'tis the season? alright guys, it's official; once Remembrance day is over, Christmas begins! don't resist, you know you love it. I know I already posted my autumn wishlist not too long ago... and since I haven't done any shopping I still want them... but now it's pretty much winter, I have a whole-new Christmas wishlist! YAY. don't lie, you know you're excited. 1 + 13. another camera bag, because a girl needs options. from epiphanie bags & porteen gear, respectively. 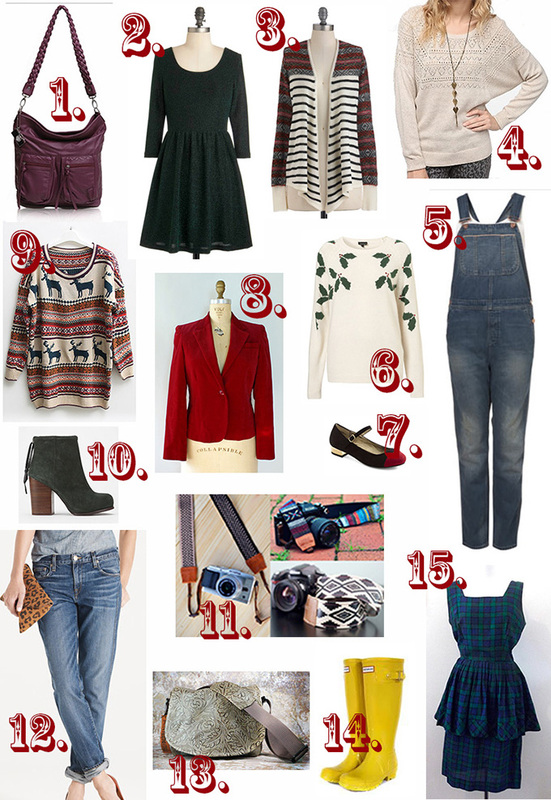 3, 4, 6, + 9. cute & cozy sweaters, especially in nordic or Christmas print. from modcloth, urban outfitters, topshop, & oasap, respectively. 5. guys, I really want a pair of overalls. don't hate. from topshop. 7. ok, these are just cute. from modcloth. 8. I had a red blazer for a brief period. it's too small now. besides, this one's velvet! from chatte jolie. 10. I am still dying for these Jeffrey Campbell boots. only now I want them in olive green... from urban outfitters. 12. the perfect pair of boyfriend jeans. I can't find a pair anywhere, but these would probably do the trick. from j. crew. 14. they were on my list last year, but this year I want yellow! and cozy cable-knit lining. from hunter boots. 15. a vintage plaid dress, because Christmas is the season when plaid and class come together... or something that's a good reason to get a vintage dress. from miss mittens vintage. so that's it! be prepared for this blog to get a lot more Christmas-y, folks. You will be getting none of these from me!